Winds are from the Northeast at 13.8 gusting to 19.6 MPH (12 gusting to 17 KT). The humidity is 56%. The wind chill is 54. Last Updated on Apr 21 2019, 1:55 pm CDT. Support for Park Falls operations is generously provided by a grant from NASA's Carbon Cycle Science Investigation Program. We also thank Jeff Ayers for his assistance maintaining the instrument. Park Falls, WI 54552 U.S.A.
For container hardware information, see this page. Current picture of the Park Falls site. Archived hourly pictures can be found here. 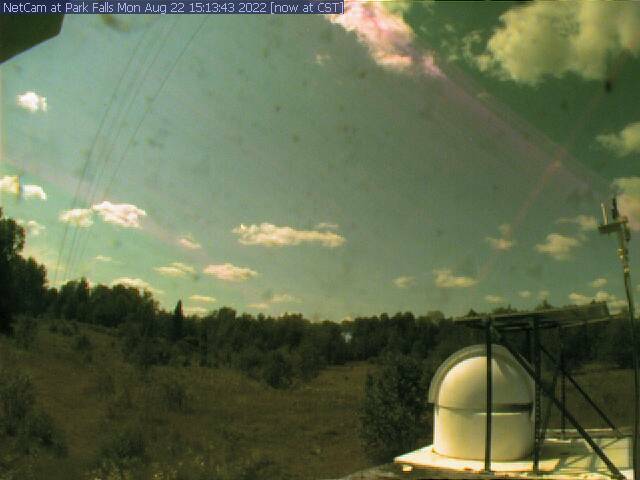 Live webcam images here.